A New Dimension in Live Streaming Radio on your mobile phone. Learn life long skills and be inspired to live your life well! Listen to interviews and podcasts with authors, health and nutrition experts and accomplished health practitioners on topics which address the key challenges individuals and families are facing in a rapidly changing economic and social environment. Health issues include: anxiety, depression and stress-related diseases, obesity, diabetes, addictions, and new therapies, supplements, mindfulness, meditation, yoga, relaxation and stress reduction. Living Well Radio is here to inspire and empower you to be proactive in taking charge of your own health and wellbeing. The APP connects you with a global community of individuals who are passionate about making a difference to the health and wellbeing of people and caring for our planet. Enjoy new music and discussions that you won’t hear on mainstream radio. 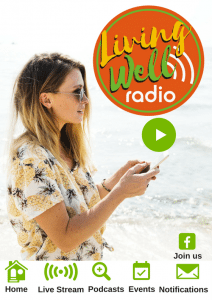 The APP provides access to live events like the Living Well Festival and Conscious Living Expo and updates on the Program of Speakers, Exhibitors, News and Blogs as well as Magazine articles.